There once was a contest, sponsored by Ryobi, and a cute little red-haired blogger who wished to enter. The challenge was to use only one piece of wood, an 8 ft – 1 x 8 board to be precise, and to make something fabulous. 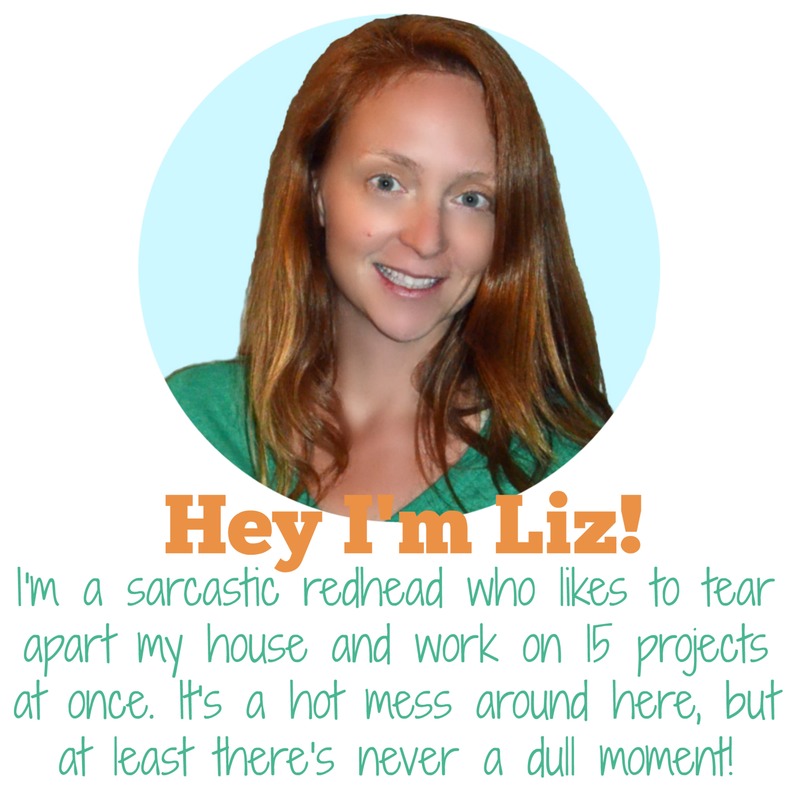 The red-haired blogger knew she had more than a month to come up with the perfect project, so she put it off, and she put it off, and she put it off. Then, on the last day of the contest, while her kids were away at school, she decided to get to work and built something. She built a magnificent ladder that even her husband and teenager were impressed with. Her dear friend Cindy longs for such a ladder of her own. The red-haired blogger even repainted her entire bathroom, just to take even more fantastic photos. The little procrastinating blogger made the deadline had pictures of her ladder published to all her social media accounts before the clock struck midnight. But alas, the little blogger did not win. THE END. But I did have fun racing against the clock and building something practical. And if you want to build one of your own, I’m going to let you in on the step-by-step process. Start with an 8 foot 1″ x 8″ board. I used cheap pine. Cut off the top 16″, this establishes the width of the shelf, and therefore the ladder. Rip the remaining wood into 3 pieces – two measuring 2.75″ wide for the rails, and whatever is leftover for the slats. Cut the ends of the rails at an angle so they will sit flush against the wall and floor. Cut the remaining skinny piece into five 16″ slats. Attach one of the 16″ slats to the side of the first 16″ shelf piece. This will bring the shelf’s depth from 7.5 to 9″, which made it deep enough to hold my folded towels. I simply used glue the two pieces and held them together with some clamps. Distress the wood. This is the most enjoyable part! I used a multi tool to scrape along the edges of the wood, giving it a rounded look in places. I used the same tool to poke little holes and then I scraped at the wood with a screw and pounded at it with a hammer. It legit looked old and beat up. Stain the pieces BEFORE you assemble them, it is so much easier this way! You can make it look worn and faded, if that’s your thing. I used two different stains, first covering everything with Rustoleum Weathered Gray. Then I went over most of the wood with Minwax Dark Walnut, heavier in some spots. I skip the brush and use my son’s cut up old pajamas to rub the stain on. I only had about 2 hours to let it dry. The basket rests on the bottom slat. Now that the one board challenge is over, I might make another full sized shelf down there. So my bathroom storage ladder leans well enough against the wall, but I might add brackets to attach it one day too. We’ll see. For now the family is enjoying it as is.